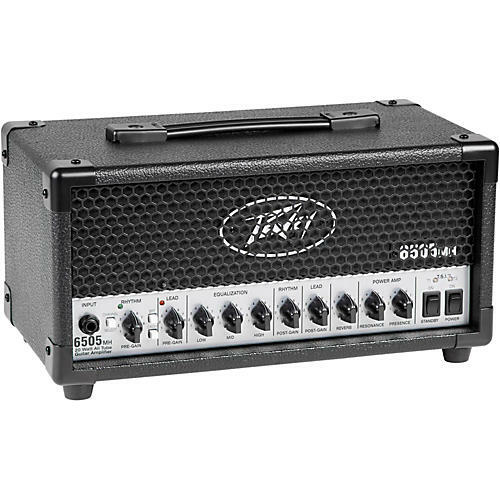 Part of Peavey's celebrated 6505 Series, the all-tube 6505 MH authentically produces the legendary tones of the Peavey 6505 in a small, portable package. The 6505 MH has two channels that follow the same gain structure and voicing of its iconic big brother to produce the devastating, overdriven tones that have defined the sound of modern metal music for more than two decades. The channels share EQ, lush reverb and an effects loop. Channels, crunch, effects loop and reverb are all footswitchable. Peavey's TSI tube monitoring indicator keeps players apprised of power tube status, and in the event of a necessary tube replacement, identifies which tube needs to be replaced. Rear panel features such as an effects loop, Microphone Simulated Direct Interface (MSDI) with XLR output and USB out, speaker defeat switch and a three-position power attenuator switch make the 6505 MH an ideal tool for recording or use in smaller venues.